Whether you want to explore the bike trails, different hiking areas, or just wander unimpeded down the Cape's many Main Streets, the best time to get Cape Cod to yourself can be the wee hours of the morning. As the sun is rising above the peninsula, there is a certain charm to Cape Cod that cannot be replicated at any other time of day. Early morning on Cape Cod brings the promise of tweeting birds, land kissed by dew, and some days even an early morning fog that creates an enticing atmosphere of contemplation. If you wander the streets between 5am and 6am, you will more than likely be the only person out. The absolute quiet and solitude is something that cannot be replicated and you will truly get a feeling of Cape Cod charm. Most mornings the smell of the sea is hinted at in the air and a slight salty breeze will invigorate you for the rest of the day, when everyone else comes out to enjoy the shops and beaches. An early morning walk on Cape Cod is well-worth it and is something that all visitors should try at least once! 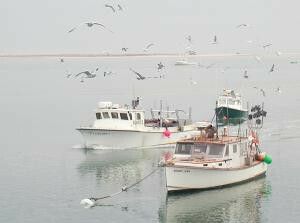 If you get out early enough, it will likely be you, the gulls and the fishermen, here at Chatham Harbor. Walter Brooks photo.